When Austin’s winters fail to produce even the slightest chill, as is currently the case, I find myself, without fail, recalling a certain scene from one of my favorite films. An old Russian sea captain, his eyes fixed on the horizon, stands on the deck of his vessel, a nuclear submarine, and returns a trivial remark about the cold weather to one of his officers. In that moment, it is clear that the elements are the last thing on his mind as he consequently and irreversibly captivates us. That scene is from 1990’s The Hunt for Red October, and we hope you’ll consider giving it a spin via Netflix’s Instant Watch service. Who Made It: The Hunt for Red October was directed by John McTiernan, who is best known for giving us the action film standard that is Die Hard. McTiernan also gave the ultimate mercenaries-vs-aliens film with 1987’s Predator. The Hunt for Red October is a decidedly different film for him, but we’ll get to that in a moment. Who’s In It: Easily one of the biggest draws of The Hunt for Red October is its tremendous cast, in terms of both size and excellence. The cast is lead by the incomparable Sean Connery and a baby-faced Alec Baldwin. In addition, the film boasts Sam Neil, Scott Glenn, James Earl Jones, Tim Curry, Stellan Skargard, and Jeffrey Jones. Usually Quentin Tarantino has to be involved to wrangle this much talent in one film. What’s It About: Taking place in 1984, still very much in the midst of the Cold War, The Hunt for Red October is the story of a Russian nuclear submarine, The Red October, equipped with an experimental new propulsion system that allows it to run almost completely silently. The captain of this submarine disobeys his direct orders and makes a b-line for U.S. waters. When alerted to this, the Navy scrambles to mount a counteroffensive and blow The Red October out of the water. But is this rogue Russian sub captain out to initiate World War III, or is he, as one you analyst suggests, trying to defect and hand the sub over to America? The Hunt for Red October is one of several films based on a novel by Tom Clancy, a man who specializes in political and military thrillers. More specifically, it is the first of four Clancy adaptations to revolve around his recurring character Jack Ryan, played in this initial outing by Alec Baldwin (the role would later be played by Harrison Ford in Patriot Games and Clear and Present Danger, and Ben Affleck in The Sum of All Fears). 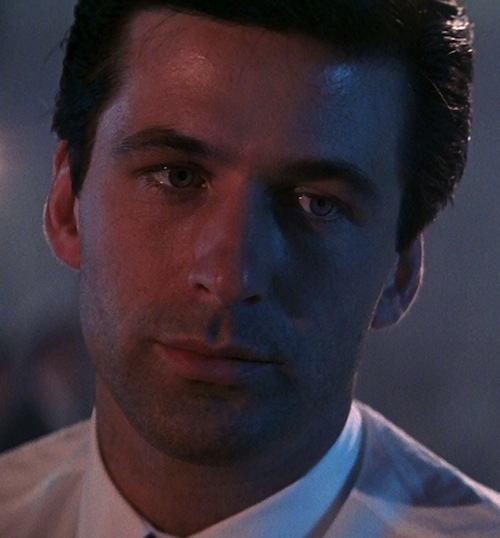 Alec Baldwin’s depiction is my favorite—his Ryan is a lovable fish-out-of-water who gets more assertive as the film progresses. As an analyst, you might doubt his heroic capacity at first, but by the time he cuts himself free of the helicopter tether, plunging himself dangerously into the ocean rather than delaying his mission, your doubts will be thoroughly assuaged. Let me be as clear about this as I possibly can: any film featuring Sean Connery is worth seeing. Even the dreadful Avengers is worth one viewing thanks to him. Yeah, I said it. Connery plays Marko Ramius, the rebellious captain of the Red October. He plays the character with so many remarkable facets, not the least of which is his dizzying cunning. He makes reference at one point to playing a game of chess, and that parallel is quite apt considering Connery’s character always seems to be thinking several moves ahead. It is fascinating to watch his plan unfold. The Hunt for Red October is a magnificent thriller, but one that interestingly incorporates conventions of the genre into a cerebral military strategy film; again, the chess metaphor is upheld. But just when you might expect the film to list into tedium, that’s when an unexpected murder or a shootout or a submarine battle sequence will crop up. Not so much to win back your attention, but as a reminder of the stakes at play in this dangerous game. At the risk of alienating any female readership, The Hunt for Red October is one of the quintessential “guy movies.” I’m not at all saying that women won’t appreciate it, but it’s a film focused on warfare, Scotch-swilling, constantly asserting dominance over one’s peers, and Sean Connery’s badassery. Yup, that about sums up what we look for in film. You win again, John McTiernan. Find more recommendations in our past For Your Consideration columns!